In 2016, DIA continued to perform well in the stock market, thanks to a business model based on efficiency and profitability. During a challenging year for the food distribution sector in Europe, the company shares, listed on the Madrid Stock Exchange and which form part of the IBEX 35, closed the year at a price of EUR4.665. 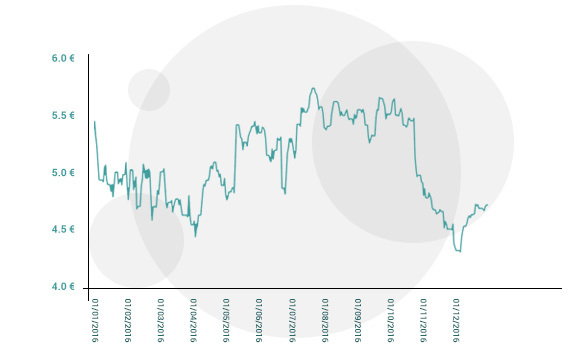 This closing price represents a 14.3% decrease in 2016, but shows a cumulative appreciation of 45.6% since it started trading on the Stock Market in 2011. In the same periods, the IBEX 35 declined by 2.0% and 9.5%, respectively. 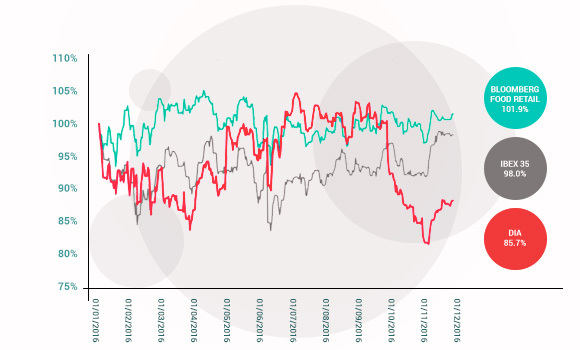 This year, the market has again valued the company’s capacity for growth and profitability in a tough consumption context and a significant currency devaluation in markets such as Brazil and Argentina. The highest closing in 2016 took place on 22 July, at EUR5.755 per share, while the annual low was recorded on 12 June, with a close of EUR4.224 per share. The average trading volume during the year was 4.8 million shares daily, which makes DIA one of the most liquid stocks on the Spanish stock exchange, both in terms of absolute transaction volume and rotation of the shareholder base. 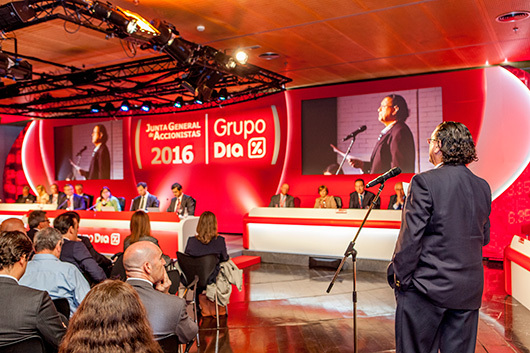 In keeping with the commitment to offer increased shareholder profitability and, as agreed upon at the General Shareholders’ Meeting held on 24 April 2016, the DIA Group has again raised returns with the distribution in July 2016 of a dividend of EUR0.20 per share charged to 2015 results, which represents an increase compared to the previous year of 11.1% and a cumulative growth rate of 81.8% since the company was listed in July 2011. This dividend represents a payout calculated against the underlying net profit of 49.8%, representing an approximate payment of nearly EUR130m in dividends to shareholders. At 31 December 2016, DIA held 11.1 million treasury shares (1.8% of the capital) to cover the various remuneration items of shares included in the Incentive Plans for the Company’s management team. For the 2017 financial year, the General Shareholders’ Meeting will propose the distribution of a gross dividend of EUR0.21 per share charged to 2016 results, 5% higher than the previous year. (From 1 January to 31 december 2016). (From 1 January 2016 to 31 December 2016). In mid-April, the company issued, under its Euro Medium Term Note Programme (EMTN Programme), a series of Notes in the Euro market in an amount of 300 million euros. The issuance, which matures after 5 years and whose settlement date was 28 April 2016, has an annual coupon of 1.00% and an issue price of 99.424%. The Notes were admitted to trading on the Irish Stock Exchange. In addition to the Ibex 35, since 2015 the DIA Group has also been listed in the FTSE4Good international stock exchange index, which includes listed companies from around the world that provide information on parameters such as corporate social environmental responsibility practices, shareholder relations, and human rights. This year, the index has been revised twice to allow new companies to join and to stop following those that no longer make public the information requested. The FTSE4Good, which uses the information provided by the Ethical Investment Research Service, was created with the collaboration of UNICEF, the UN Fund for Children. The DIA Group has a team responsible for maintaining a direct, clear, and fluid relationship with its investors. The department is governed by the principles contained in the investor Communication Policy approved by the Board of Directors in 2015, which encompasses a series of action principles to protect the rights of shareholders, institutional investors, and the markets in general, and is available on the corporate website. Shareholders and investors have different communication channels, through which detailed information is provided about the company on stock market and business matters, thus maintaining an open, efficient, and transparent dialogue. Through the corporate website www.diacorporate.com, the company offers real-time information on the stock performance, relevant facts, Corporate Governance and financial results, in addition to offering the possibility of subscribing to a channel to receive the most relevant notifications. The website complies with all the technical and legal specifications established by the National Securities Market Commission (CNMV) in its Circular number 3/2015 of 23 June. In 2016, the department of Investor Relations of the DIA Group organized more than 1,200 information activities in different areas, such as face-to-face meetings, webcasts and conference calls, all aimed at offering the most current and accurate information to the market. The most important shareholder events, such as the quarterly presentation of results and the General Meeting, are retransmitted via webcast, in line with the company’s strategy of transparency and fluid communication with the investment community.